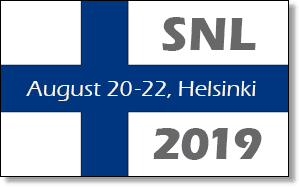 Welcome to the Eleventh Annual Meeting of the Society for the Neurobiology of Language which will take place August 20-22, 2019 in Helsinki, Finland. This year we will have three very exciting days to enjoy an amazing program. This includes three keynote lectures (Nikolaus Kriegeskorte, Dorothy Bishop and Frank Guenther), talks by our Early Career and Distinguished Career awardees (still to be selected! Please send us your nominations), three Slide sessions, and five Poster sessions – each preceded by our now tried and tested ‘Poster Slam’! This year we also have two Symposia: one on Dyslexia entitled, Latest Research on the Neurobiology of Dyslexia, and another on Cognitive Neuroscience Methods entitled, Windows into Language: Benefits and Challenges of Combining Methods. In addition, the day before the meeting starts, there will be an Educational Course: Investigating Language with MEG. This will be a good opportunity for students and researchers interested in using MEG to find out more from Finnish teams who have been instrumental in the development of MEG as a technique. The evening before the meeting starts we will host a Public Lecture by Teppo Särkämö entitled, When Words Fail: Music in aphasia and dementia rehabilitation. The goal of these lectures is to raise awareness in the general public about language-related issues and to promote research in the field of the neurobiology of language. Therefore this lecture will be delivered in Finnish. Please join us for the Opening Night Reception at the Banquet Hall of the City Hall thanks to the generosity of the City of Helsinki. I would like to thank the Program Committee for putting together an exciting scientific program: Brenda Rapp, Mairéad MacSweeney, Sonja Kotz, with special thanks to Marina Bedny as Program Committee Chair and Riitta Salmelin as head of the Local Arrangements Committee. Shauney Wilson, Shawna Lampkin, and their team also deserve our huge thanks for their skill in organizing and running these meetings. As you know, the possibility of an open access journal was raised at the SNL meeting last year. I am thrilled to announce that this has now become reality. SNL, in a joint venture (co-ownership) with MIT Press, has just launched a new open access journal titled Neurobiology of Language. Steve Small and Kate Watkins have agreed to take on the responsibility of being the two Editors-in-Chief for the first 5 years. Under their expert leadership, I am sure that they will make the journal a great success. Finally, I would like to especially thank Matt Davis – the SNL Publication Officer. Matt has worked extremely hard over the last year on making this journal a reality. To do this he’s had to show great patience in carefully balancing the needs of MIT and SNL. We will tell you more about the new journal at the SNL meeting in Helskinki. For this to succeed, it will need support from YOU, the SNL members. I hope you’re as excited about this venture as we are, and we look forward to telling you more about it.